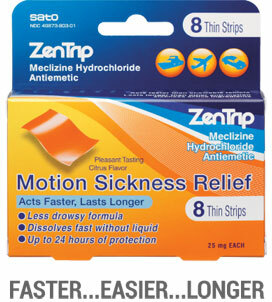 ZENTRIP: The faster, easier, longer Relief Strip that helps prevent and treat nausea, vomiting or dizziness associated with Motion Sickness. Inactive Ingredients: Acesulfame Potassium, Hypromellose, Polyethylene Glycol 400, Mannitol, Menthol, Orange Oil, Sucralose, Sucrose Esters of Fatty Acids, Ferric Oxide. Keep out of reach of children. In case of overdose, get medical help or contact a Poison Control Center right away. Do not use for children under 12 years of age unless directed by a physician. 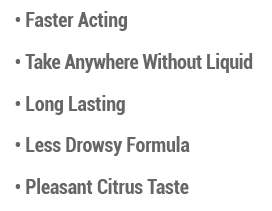 Adults and children 12 years of age and over: Oral dosage is 1 to 2 thin strips (25mg to 50mg) daily, or as directed by a physician. Take at least one hour prior to activity. Use only if the carton overwrap imprinted with the words “SAFETY SEAL” is intact at time of purchase. Copyright © by SATO PHARMACEUTICAL CO.,LTD. All rights reserved.